Both activities focus on how a bill becomes a law. There is a vocabulary slide that has these vocabulary words and their definitions at the beginning of the PowerPoint. The essential questions are as follows and are repeated at the beginning of the PowerPoint and then again at the end. 1. 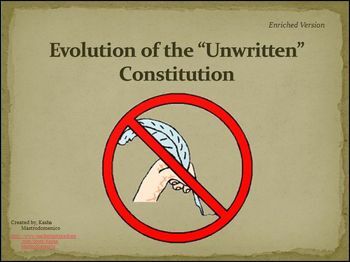 What are the five “unwritten” parts of the Constitution? 2. What was the main difference between the federalists and the anti-federalists? 3. How does a bill become a law? Below I have provided the links to the PowerPoint and the Lesson Plan that are sold individually so that you can see the ratings and comments of each of them. Please download the preview file so that you understand more about what you will get with this purchase. This lesson plan was last revised on 10/23/2013. All links worked on that day. I cannot guarantee any of the links because I do not control the internet. Thank you in advance for rating and commenting about this lesson plan. Please be specific when you comment so that other teachers know why you rated the way you did. If you rate that their are inaccuracies, please let me know in the comment what they are so that I can fix them. You help me become a better teacher and writer. 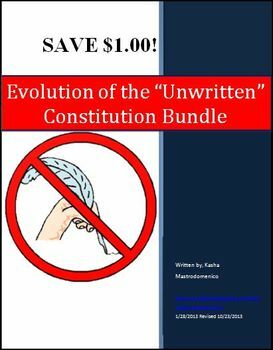 Evolution of the "Unwritten" Constitution Bundle by Kasha Mastrodomenico is licensed under a Creative Commons Attribution-NonCommercial-NoDerivs 3.0 Unported License.